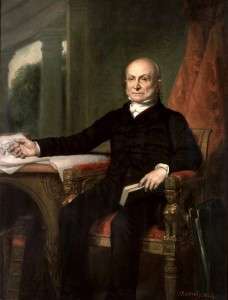 John Quincy Adams collapsed on the floor of the House of Representatives on Feb. 23, 1848 and died two days later. After spending more than 50 years in the public eye, we often remember this president, congressman and diplomat for his quirks - his pet alligator or swimming naked in the Potomac or even his near drowning. His diaries serve as a wonderful record of just how full a life he had and how much he did to promote American economic and foreign policy interests. But in political and social terms, he is probably best remembered for his opposition to slavery. He found slavery to be revolting, and he never missed the opportunity to speak out against it or draw his opponents into having to defend the practice. Even when he had virtually lost the power of speech, he never let up the fight, and he quite literally stayed in the arena until the end. John Wentworth, the son of Sandwich, N.H., who went on to serve as mayor of Chicago, recalled serving with Adams in Congress in 1843 just five years before Adams died. He wrote of the various nicknames that could be bestowed on him, from "old man eloquent" to "old man malignant." "John Quincy Adams was 76 years of age when I first took my seat with him, in 1843, and I served with him until he fell in his seat, in February, 1848, having served his Country for over a half-century, and in a greater variety of responsible positions than any other man. "He was called the "old man eloquent;" but his eloquence was not of words or sentences or fancy. Nor was it the eloquence of Patrick Henry, Henry Clay, Daniel Webster, Edward Everett, or Charles Sumner. It was the eloquence of varied and as near universal (as could be said of any man) information, exhibited in the fewest possible words and with a sincere vehemence that demonstrated that he did not care where he hit nor whom he hurt. "It was a sort of "sledge-hammer" or "stand-from-under" eloquence. He might more properly have been called the "old man satirical." The South called him the "old man malignant," as slavery had never received such ponderous blows as it received from John Quincy Adams. He very seldom spoke upon the ordinary subjects of legislation; but when he did, his fellow-members would assemble around him and listen with the profoundest attention to his generally-acknowledged words of wisdom. But he lost no opportunity of introducing the slavery question, and of provoking the ire of its friends, daring them to disputation, justification, and proof. "During one of his bitter philippics, a Southern member interrupted him by saying that nothing but his old age prevented a personal castigation. Mr. Adams responded: "I claim no favor on account of my age. I shall never call for United States troops to protect my manhood, as the South does to protect its want of manhood in enslaving an inferior race." Upon a few occasions he so far passed the bounds of delicacy as to charge that slavery had defeated the reelection of every Northern president. Little did he think, however, during his last session, that there was, within the reach of his feeble voice, an obscure member from the Free-States who was to be reelected upon this very slavery question. Still less did he think that that colleague, the first Northern president to be reelected, was to be assassinated [Abraham Lincoln]. Had he been alive at the assassination, he would not have been in his seat many hours before he would have found occasion to say: "The slave-power assassinates whom it can not defeat." "Conspicuous as Mr. Adams always was, he became more so after he was struck down by a paralytic attack, which deprived him of most of his physical strength, and reduced his voice to but little above a whisper. His sight and hearing, like his intellect, however, were preserved to the last. Occasionally, when things were said which did not suit him, he would so far forget his infirmities as to attempt to rise, and then, when he would abandon the attempt, he would give a look to the man who had been speaking, indicating that it was well for him that a reply could not be made. It was understood in the galleries, as well as in the house, that the color of his head was the index of his feelings, it often becoming as red, under the violent declamations of Southern men, as living coals of fire. "A Southern fire-eater was vehemently denouncing Northern anti-slavery men, when Father Adams' head fired up with his usual indignation. Some waggish member exclaimed to the orator: "He says you are lying." The speaker at once dropped the line of his speech, assumed a belligerent attitude, and exclaimed: "Who says I am lying?" "Adams," "Adams," replied several members. The laughter which followed was. greatly increased when Mr. Adams,'putting his hand upon his head, gave a significant nod, as much as to say: "I do say he was lying." No man was more regular in his attendance upon the sessions of the House. The same can be said of the Sunday service at the Capitol, he always occupying the same seat. He was with us there the last Sabbath of his life."